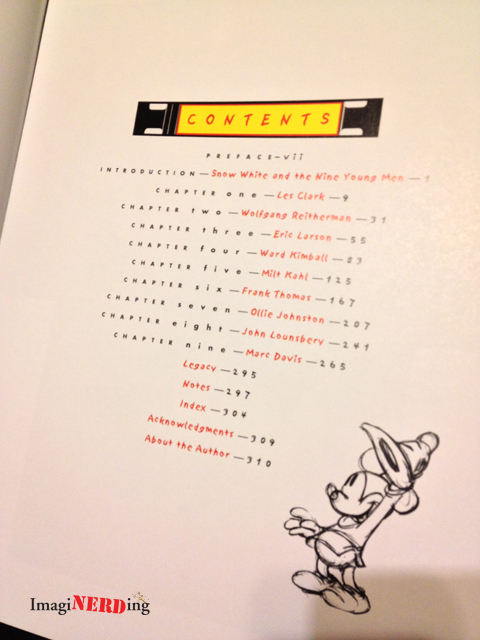 Walt Disney’s Nine Old Men and the Art of Animation by John Canemaker. 2001, 308 pages. Walt Disney’s Nine Old Men and the Art of Animation is the first book to take an in-depth look at the artists that shaped the Walt Disney Studios before and after Walt’s passing. The Nine Old Men reference relates to Franklin Roosevelt’s description of the Supreme Court Justices—Walt used it as a joke and it stuck (the name came from a 1937 book called Nine Old Men). The Nine Old Men would become the most creative and powerful people at the Studios. The litany of characters that they have brought to life is simply astounding. John Canemaker is an animation historian, animator and professor of film animation at New York University’s Tisch School of the Arts. He is a very successful author with seven books (three just about Disney animation) and 100’s of essays and articles to his name. Mr. Canemaker is also noted for several award-winning short films. Mr. Canemaker begins the book with a look at the Nine Old Men’s formative years: Snow White and the Seven Dwarfs. Most of the Nine Old Men were hired at the Studios in the mid-1930’s. Before them, were legendary men that were mentors and friends to the new artists. Vladmir Tytla, Grim Natwick, Norman Ferguson, Hamilton Luske and Fred Moore were put in charge of various departments and sections of Snow White. As time progressed, many of the Nine Old Men were mentored by these animation pioneers. For many reasons, the previously mentioned animators left Disney or found they could not keep up with the younger crowd. Mr. Canemaker touches on the influential animator’s lives throughout the chapters on the Nine Old Men. Mr. Canemaker devotes a chapter to each animator and takes you from their birth to the present day (in 2001) or their passing–he has created a condensed biography and Mr. Canemaker successfully brings the important details to the top that seem relevant to the creation of the animators. You follow each artist from their birth, early family life, school, travels and eventual beginnings at Disney. All of the Nine Old Men stayed with the Disney organization until their retirement They were also faithful to the Studio during the Strike. Undoubtedly, this cemented Walt’s opinion of them. Family photographs, animated film stills and corporate images fill the volume. Mr. Canemaker shares a lot of great anecdotes about the artists. Did you know that Ward Kimball attended over 22 schools growing up and that Marc Davis’ family traveled the country, rarely settling in one place for more than a few months? Wolfgang Reitherman was a pilot in World War II and claims that he was only a director because Walt told him to be one. Throughout each chapter, Mr. Canemaker shares what makes each animator so important to the Disney Studios and animation. As you go through the chapters, you see each animator as a different personality to the whole. Each one distinct and filling a specific role within the Studios. After the Animation Strike, the Nine Old Men were charged with being the review committee for the Studios. A film couldn’t be made without their direct involvement and an artist could be fired at their whim. After Walt’s passing, the Nine Old Men were the creative force and were often left stumbling as to the direction to be taken at the Studio. 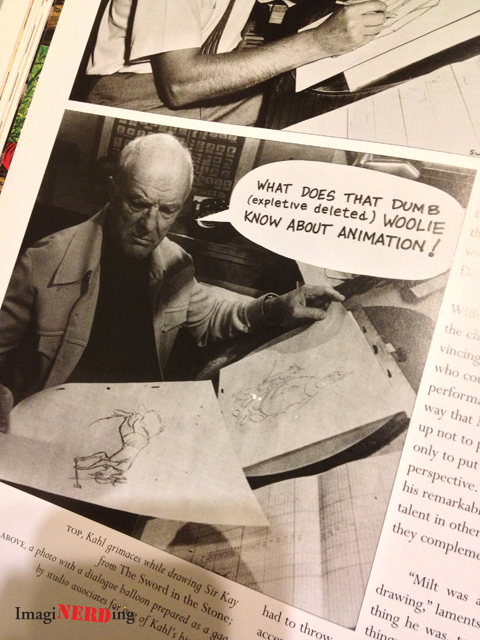 As expected, a majority of the book does focus on animation. Marc Davis was really the only one of the Nine Old Men asked to work on the Disneyland Project. The book does cover that section of Marc’s career; starting with the Mine Train Through Nature’s Wonderland in 1962, the World’s Fair attractions, Pirates of the Caribbean and the Haunted Mansion. Ward Kimball is mentioned in conjunction with Disneyland through his shared loved of trains with Walt. 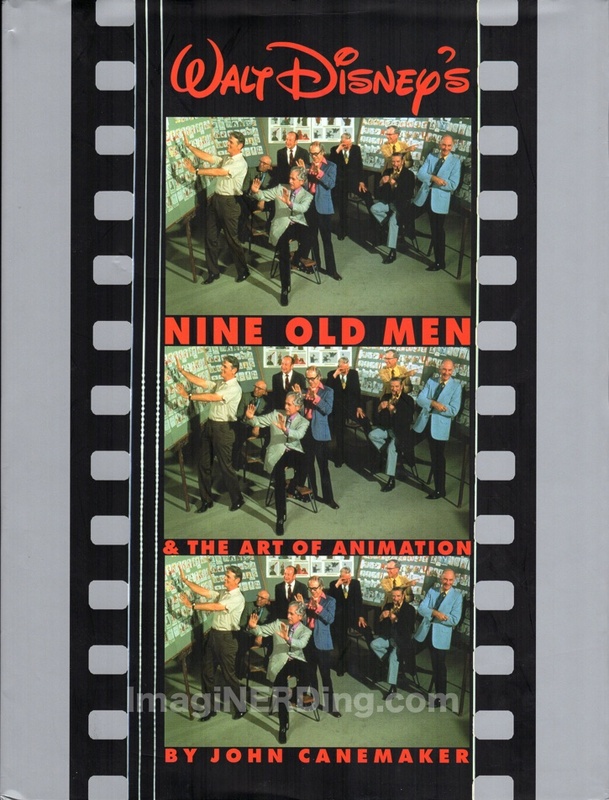 This book truly shines as a mini-biography of the Nine Old Men and how they moved the art of animation forward. Bottom Line: This is a book that I highly recommend for animation enthusiasts and people interested in the Disney Studios formative years. It brings together information about the early years of the Studio and the roles of the Nine Old Men in animation, the Studio and the Company–unlike any other resource. Most of the book does deal with animation and the classic characters that were created but it does focus on the theme parks with Marc Davis and Ward Kimball’s contributions. You want this book if you have any interest in learning more about Walt Disney’s Nine Old Men and their art.